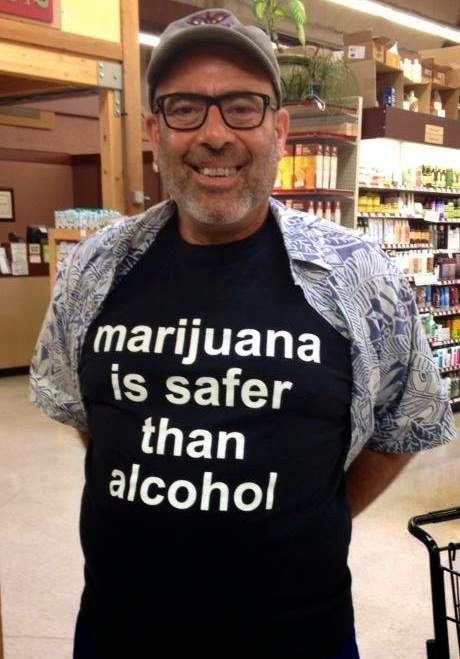 A safer guy took a pic of himself wearing one of his +Safer Shirts at the store. He uploaded it to Facebook and a lot of people were happy to see it. "Marilyn Berman Not so sure anymore. Theses days it causes psychosis and can bring on schitzophrenia . It's no joke , a different animal and ruining young peoples lives. I don't think it should be glorified !" Feel free to participate in this public conversation taking place under this public post on Facebook. Spread the word wherever it can be heard, in person and online! Spread the safer message, read the book, make a stencil, make a shirt. Keep the movement going! Thank you, Thank you, Thank you!